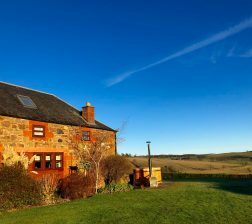 This converted sandstone steading which sleeps up to ten people, in its five bedrooms and four bathrooms, enjoys an elevated position with commanding views of the surrounding rolling countryside. 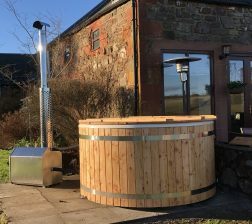 It has just got even better with the installation of a wood fired round hot tub for 6 beside its large patio. Pitfield already has great outside entertaining areas in the form of a west patio and a large east patio. We are located in rural Perthshire but within 20 minutes of Perth or Dundee city centres. 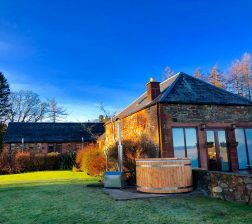 We are concentrating on wellness up here – relax in your hot tub with amazing views daytime or check out the starry skies daytime. 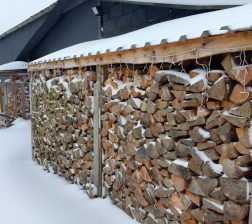 Visit our wellness gym area and do some light stretching or let all your worries slip away while taking a sauna in our wood fired swedish sauna – and wake yourselves up with a cold shower outside or a roll in the snow (snow subject to availability!!). This property, Pitfield, is our 2 cottages Pitmiddle and Outfield rented out as one large house. 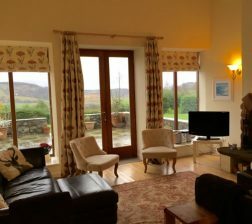 There is an interconnecting door between the two of these cottages which we unlock and open up to enable the flow between the 2 properties. This door takes you from the living/kitchen/dining area of Pitmiddle down 3 stairs into the corridor outside the downstairs bedrooms in Outfield. It is probably easiest to use the Pitmiddle front door as the main door for the property as there is extensive parking outside it. There is still the option to park down the side of the building towards the front door of Outfield. The wi-fi is in both the kitchen/living/dining areas. 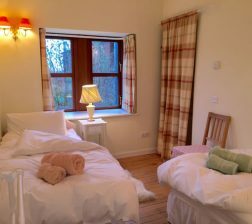 Guests are able to have shared use of the tennis court with Honeysuckle (2 bedroom cottage). The surrounding garden area is not fenced so please look after pets. The accommodation is on 2 levels at the Outfield end of the property, the upper level was once a hay loft and therefore has low level windows as well as velux windows. 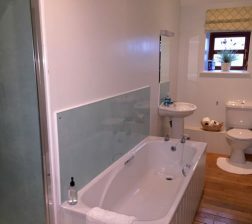 This level houses the large master bedroom with its en suite bathroom with shower over the bath. The other en suite bedroom (with shower) is at the Pitmiddle end of the property beside the third bedroom which has its own bathroom next door (bath and separate shower). Down at the Outfield end of the property you have bedrooms four and five next to each other and they share a further family bathroom. These bedrooms are small, although they can be set up as superkings, but are often roomier when set up as singles. All of the beds can be superking (6 foot wide) or they can be separated to form 2 singles (twins). This property has 2 living/kitchen/dining areas and most larger groups tend to have the dedicated kitchen in the Pitmiddle end of the house as there is most room for the table to extend. 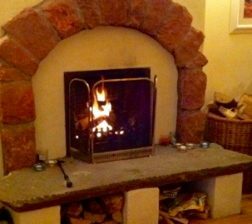 Dine in comfort with a roaring open fire in the background in winter or the patio doors open in summer. You can also use this room to entertain children with the TV and DVD if adults are congregating at the other end of the house. The dedicated living space/sitting room tends to be at the Outfield end of the house where we have the huge tall windows and patio doors effectively bringing the outside views in. There is an open fireplace and extremely comfortable leather seating that is often commented on. 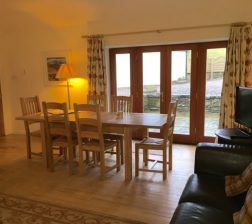 However there is also a dining table with table extensions down here and feel free to move the furniture about and place the table in front of the fire if desired. 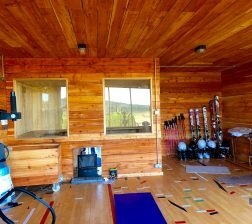 Our latest shared facility on site is a fantastic wellness room with light gym equipment and a Swedish wood fired sauna. It is located beside the tennis court and has stunning views. 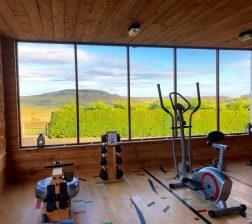 We have a summerhouse above the tennis court with great views to the east and any of our guests can use it so that they can fully appreciate the panoramic views on offer on site. 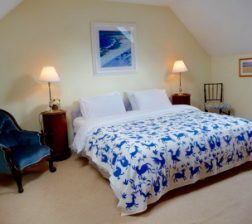 All guests are able to have shared use of this summerhouse, tennis court and games room . We have a list too of walks in the area, many starting from the farm itself. The surrounding garden area around Pitmiddle, Outfield and Honeysuckle is not fenced – so pet owners need to be aware of that – you cannot let your pet out unattended. The properties are on a very small farm accessed via a farm road. We have tried to be as environmentally friendly as we can with our holiday houses. When we converted Outfield and Pitmiddle from farm buildings into accommodation we kept the same footprint so some stables are now bedrooms! We have used reclaimed wooden flooring and the houses are powered by a geothermal ground source heat pump. Our water supply comes off the hill and is filtered in our water treatment area before going to the houses. All our fixtures and fittings are sourced locally. In order to increase our green credentials even more we are now excited to announce that in 2014 we put up a small 18 m wind turbine on the hill behind the holiday houses. 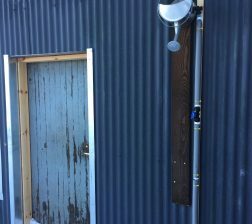 It is only an 11 kw turbine but we hope that after its first year we will have generated enough kw hours to cover our on site electrical needs. 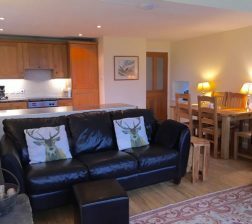 On site we have three properties, all with wi-fi in the living areas. At the other end of this sandstone building you have Pitmiddle, the two bedroom cottage. These two properties can be used as one large property when the interconnecting door is unlocked (this gives you a large five bedroom cottage called Pitfield). Also on site backing on to Pitmiddle you have the detached 1 bedroom cottage Honeysuckle. 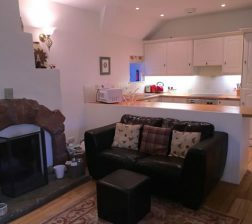 In total we can accommodate 12 guests in the three cottages.